Exactly ten years ago, Moscow was shocked by one of the most terrible terrorist attacks in Russian history – the Moscow theatre hostage crisis. RBTH recollects the tragic events of 2002. The Dubrovka Theatre was seized on October 23, 2002. During a performance of the musical Nord-Ost, a group of militants led by Movsar Barayev took the entire audience of more than 900 people hostage. The guards could not stop the well-prepared gunmen, who made their way onto stage to make their demands for Russia to withdraw federal troops from Chechnya. The siege lasted for three days. Russian politicians offered themselves as hostages. The mission that involved Russian celebrities, among others, failed. “We want to die more than you want to live,” Barayev said then. As a result of negotiations, the terrorists agreed to release Muslims, foreigners and a few minors. Following this, the Russian authorities received an ultimatum: the hostages would be shot if Moscow failed to begin withdrawing troops from Chechnya immediately. The theatre was stormed on Oct. 26. Before the operation began, gas was pumped into the building through the ventilation system. The Russian Special Forces (Spetsnaz) burst into the building and took several minutes to eliminate the gunmen and release most of the hostages. Yet, the tragedy was not over: 125 of the released hostages died later in Moscow hospitals. The media argued about how the use of gas affected the hostages. To make things even worse, the authorities refused to disclose the composition of the chemical agent. Speaking to a Rossiyskaya Gazeta correspondent, Vasilyev admitted that mistakes had been made with the procedural application of the gas, since special operations forces had not been trained to use it. The organizer of the attack on the theatre was identified as Aslan Maskhadov. He was killed by federal forces two years after the hostage crisis. 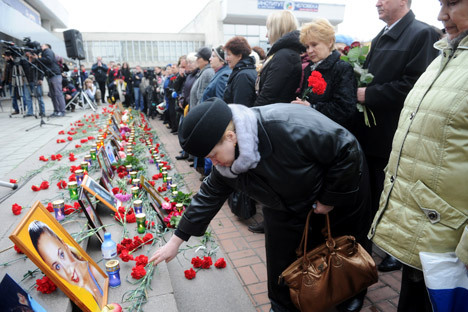 A church has been built near the Dubrovka Theatre to commemorate the victims of the attack. The church will be dedicated on October 26, 2012, on the anniversary of the storming of the theatre and the subsequent deaths of the hostages. This article is based on materials published by RBC Daily and Rossiyskaya Gazeta.